In a landslide victory, District 65 Republican challenger Sam Whitson came out on top against embattled incumbent Jeremy Durham. Whitson watched the numbers come in on Thursday night at the Williamson County Election Commission. He came out with 3,682 votes. Durham only earned 645 votes with Fairview’s Stacey Givens earned 303 votes. She was not actively campaigning. Surrounded by his grandchildren and his wife, Pam, Whitson addressed the crowd at Moe’s BBQ on Columbia Avenue. This means a lot to me,” Whitson said. “I am very grateful for all of the support of my friends, family and neighbors, and high school friends and new friends and just everybody here that has been part of this team from the very beginning. It is a very hard and heavy responsibility that we have for our 65th House District. I will never forget all of the support. 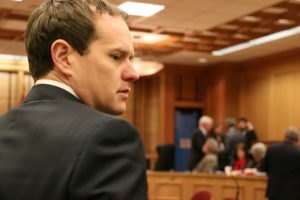 Durham has been under continued scrutiny since a Special Ad Hoc committee voted for the release of a report that detailed inappropriate behavior from the incumbent for House District 65, which had pages worth of allegations from female legislators, lobbyists and interns, including examples of inappropriate text messages, offering an under-age intern alcohol and inappropriate sexual conduct in his office in the legislature. Durham had little to say in light of his loss on Thursday night via text to the Home Page. When asked for a comment, he had short response. Democrat Holly McCall, who is running unopposed, earned 877 votes. A total of 2,984 votes were cast for Democratic candidates in the campaign. McCall ran unopposed. “We’ve spent the summer months building a formidable grassroots campaign, and we’ve found that many voters are hungry for change from the ‘same ole, same ole, go along-get along politics,'” McCall said.